You don't have to scrimp and save for French Doors. Architectural accuracy matters, and today's vinyl door sets are made in the full range of style and colors to accent a historical theme or contemporary replication. From the front door to the rear of the foyer, these ten-panel doors can come right of the manufacturing line or be custom-built to fit. Consider the options in hardware, insulation, and coatings that pay off handsomely on your investment. 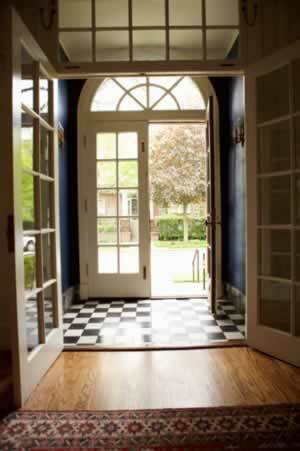 Of the many materials available for exterior and interior period doors, vinyl doors and windows stand out as a cost-effective choice that lasts, year-after-year, and requires only simple, routine washing to maintain. Consider the potential energy savings that comes with vinyl as you evaluate your choices for new or replacement French Doors. You may just find them to be a comfortable fit.